Peel squash and slice in half lengthwise. Scoop out the seeds and set aside. Slice squash into ¼ inch half moons. 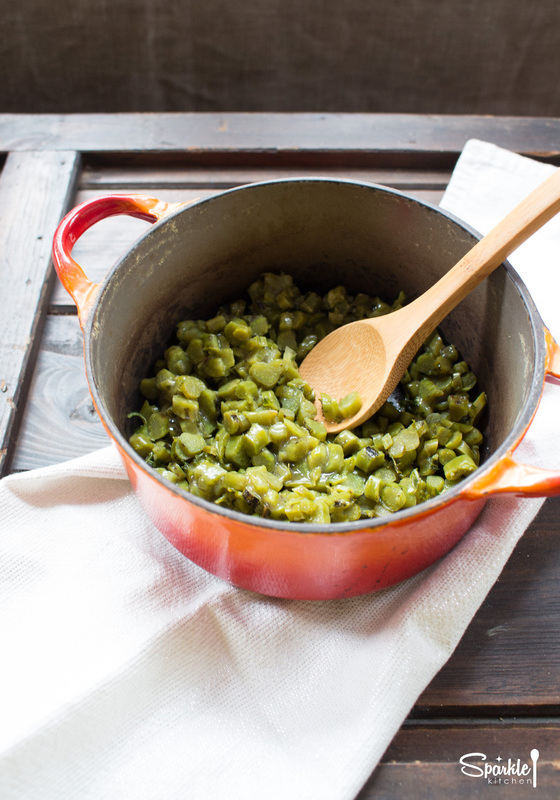 Toss in 1 teaspoon coconut oil and ¼ teaspoon salt. Place on a baking sheet and roast 10 minutes. Then remove from the oven, flip each piece of squash and cook 5 more minutes. Toss the squash seeds with the remaining coconut oil and salt. Place on a baking sheet and roast 10 minutes. Stack the leaves of kale and radicchio flat onto a cutting board. 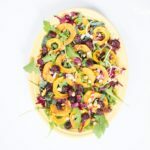 Roll up the leaves into a spiral and slice lengthwise to achieve long, thin ¼ inch strips of the leaves. Toss these with the arugula. To make the dressing, whisk all ingredients together until fully blended. 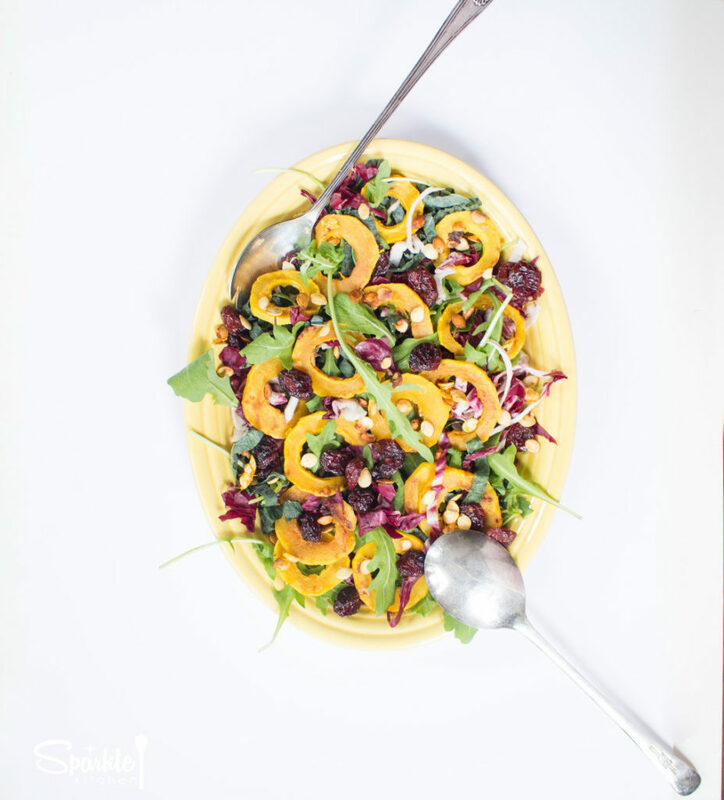 Arrange the salad by placing the mixed leaves first, then topping with the roasted squash, seeds and cranberries. Drizzle the dressing evenly over all ingredients. Serve immediately. 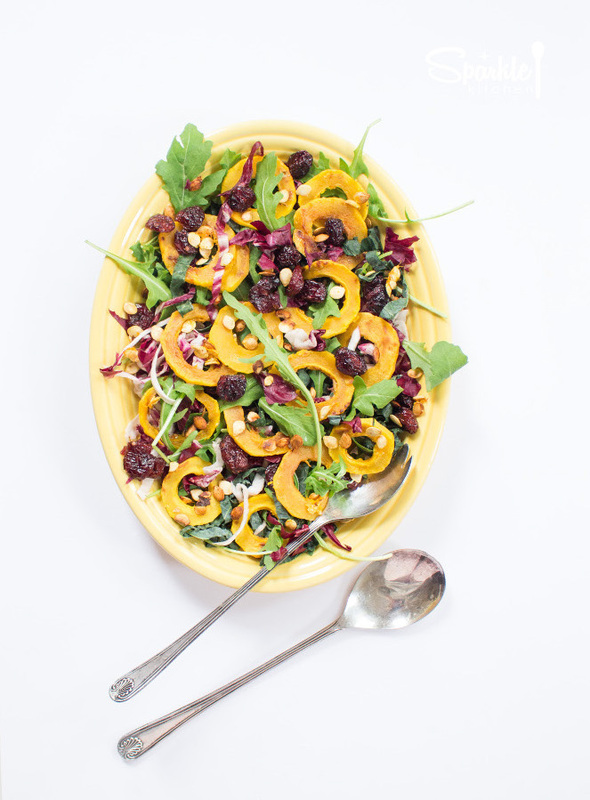 Roasted delicata squash in a fall/winter salad with lacinato kale, arugula, radicchio and a cranberry vinaigrette.